It was the Royal opening that those who travel through Heathrow Airport have been looking forward to. 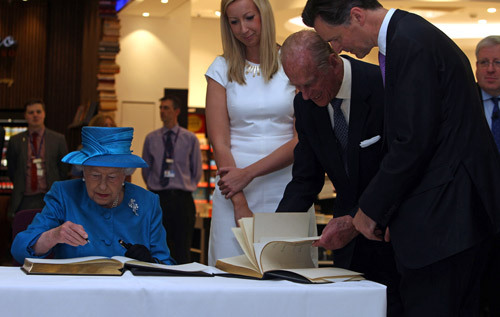 Terminal 2 — The Queen’s Terminal — was officially opened last week by Her Majesty Queen Elizabeth II. The Queen also opened the original Terminal 2 in 1955. The new terminal will be the official new home of the Star Alliance airlines, which includes three that fly to Bermuda — British Airways, Air Canada and United Airlines. Air Canada, United, Air China and ANA have moved into the terminal with the rest slated to move in from now through November. Air Canada has opened its Maple Leaf Lounge in the terminal. For people who have a bit of a layover it sounds like a great place to grab something to eat or drink or freshen up from a long flight. It includes a spa-style shower area, business centre, complimentary WiFi and a cooking station with a chef on duty to prepare meals upon request. A tended bar with Canadian brews. A bistro-style dining area and a quiet zone with three reclining pods equipped with personal satellite-fed TV screens, USB ports and Sony noise-cancelling headphones. The Star Alliance airlines will have more than 120 flights a day to 45 cities in 25 countries. Having them all in the same terminal will make it easier to connect from one airline to the next. It’s tough to be discriminated against. Princess Cruises is the latest line offering a buy one, get one half off deal, but only to residents of the 50 United States, Canada, Puerto Rico, Mexico and the District of Columbia who are 21 years of age or older. A lot of Bermudians would take up this offer if it was available here. The deal is on the line’s four- and five-day Getaway Cruises from Ft Lauderdale. During the ‘Caribbean Getaway Sale’, guests booking cruises from Ft Lauderdale that depart between August 23 and October 27, 2014 will receive 50 per cent off of the fare for the second guest, plus up to 50 per cent off for third and fourth guests. This special deal is available on four- and five-day Eastern or Western Caribbean itineraries visiting the inviting islands of Grand Turk, Cozumel, Princess Cays, Grand Cayman or Costa Maya. You might try taking it up with your travel agent or calling Princess directly 1-800-774-6237 to see if they will make an exception. I have to be honest, on my bucket list is a world cruise. The day I get to hang up my keyboard and recorder, I would love to set sail into multiple sunsets across the globe. For those of you who have the time — and the money — Holland America is offering its Grand World Voyage aboard the Amsterdam starting on January 5 from Fort Lauderdale, Florida. The cruise will last 114 days and call at 45 ports in 25 countries across six continents. The price? It starts at $19,999 per person – just over $175 a day. If you don’t have the time, or the money, to do the whole cruise, Holland America is offering segments of the trip from 22 to 57 days. As an example, a 30-day segment, starting at Fort Lauderdale and going to Auckland, New Zealand, starts at $5,299. If you want to go five more days and depart in Sydney, the cost is $6,499. The rental car agency is offering up to a 35 per cent discount and up to 5,000 American Airlines AAdvantage bonus miles. The deal is through August 31. You’ll get 1,500 bonus miles for 1-2 rentals, 3,000 miles for 3-4 day rentals and 5,000 miles on rentals of five days or more. You must use the coupon number #MUAA004 to get the deal.